Everyone loves rice crispy treats, and getting a little more creative by adding weed to the recipe makes it even more desirable. There’s just something about gnawing at a piece of this crispy treat that doesn’t make me want to stop. So if you are someone who enjoys Rice Crispies as much as I do, here’s a special recipe you can make at home. A night before you start, melt and filter out the cannabis butter into a bowl, using the cheese cloth to be sure that all the green material from the cannabis butter is dispersed. Put the cannabis butter in the fridge and leave it till the next morning. In the morning when you are ready to start cooking, preheat your oven for 20 minutes at an average temperature. Put the marshmallows in a pan and heat them. Stir them with a spatula as they melt. As the marshmallows melt, you can add the cannabis butter to it and mix it in. Continue to cook for about 2 minutes, stirring all the time. Remove from stove. Finally, add the rice crispies to this mixture and stir them until well coated. Once you have tossed the mixture well shift it into an oven safe dish, put it in the preheated oven. If you have used decarboxylated cannabis butter then keep your oven at 300 degrees Fahrenheit. If not, set it at 250 degrees Fahrenheit so that marijuana isn’t damaged. Bake for 20 minutes, take the dish out of the oven, and allow it to slightly cool. 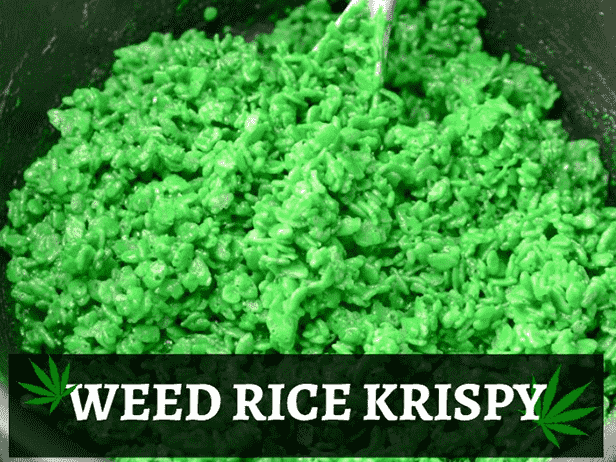 Your marijuana rice crispies treats are ready to be devoured. Sit back and enjoy your snack. Consume with caution. Start with a ¼ or ½ of the treat to make sure you don’t ingest too much at once. Before the effects of some edibles kick in, it takes as long as an hour or two.